Last October I accepted the job offer to manage Johnny’s Selected Seeds’ Research Farm in Albion, Maine. I was asked to demonstrate new sustainable production practices for the Northeast in step with Johnny’s core constituency of commercial market gardeners and farmers. Johnny’s Research farm includes 13 very different fields in soil type and isolation, radiating out as far as 20 miles from Johnny’s 18- acre “home farm” facility. 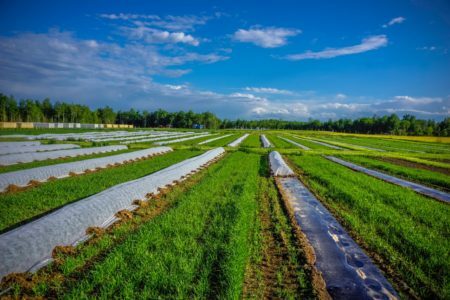 All in all there are more than 150 acres in different states of utilization and fallow, representing many soil types and agronomic potential. Many fields are stony and have no access to water. Some fields are better suited to dairy pasture, Albion’s most common farming enterprise. A handful of Johnny’s fields are prime vegetable soils– well-drained sandy loams, stone-free and level with excellent surface water access. All of Johnny’s fields share the risk of a short growing season with killing frosts and cool nights the constant threat for producing mature seed-bearing crops. One of my challenges at Johnny’s was to determine how I could get fields protected to cover crops before the narrow window at the end of the season closed. I also wanted to eliminate bare soil weed cultivation in the gaps between plastic mulch as well as reduce large purchases of nitrogen fertilizer. During the winter months farm staff modified tractor tire widths to a 72-inch outside track standard. New implements were purchased to match our 6 foot on center new standard bed width. Implements and all tractors could now access any individual plot. Multiple tasks could follow a crop management progression with implements scaled so different tasks could be initiated or completed in adjacent beds. I called this plan our rapid response modular task layout system. Conventional planting and tractor cultivation practices were still used for the small seed 3-row direct seeded crops. Beds representing different plant families in 3 rows continued to be planted in succession and planted in adjacent beds. Many large area breeding nursery crops, however, fit to a plan where cover crops could be planted in the early summer and could grow next to the research crops. 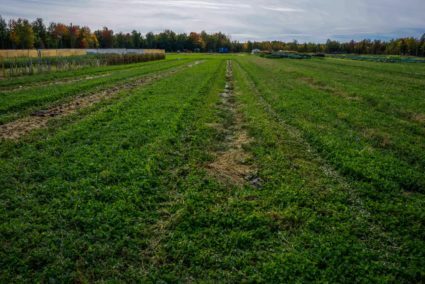 Crops benefiting from wide spacing were planted in alternating beds with “gap” beds either mulched with winter rye straw (pumpkins and winter squash) or planted to a combination of medium red clover and oats (tomatoes and peppers). The rye straw mulch smothered weeds and in some instances suppressed disease. 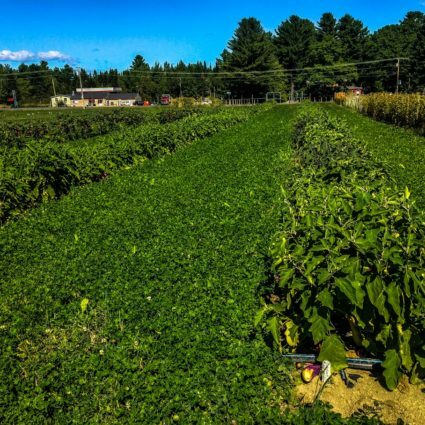 The living straw mulch system was used for trellised single-row tomatoes, double row peppers, eggplant, double row sunflowers, and trellised pole beans & snap peas. Oats were spun into “standard” beds and lightly covered with our new 6-foot tandem harrow. Medium red clover was also hand spun, then cultipacked. The cultipacker enhanced soil to seed contact & moisture conservation. Oats nursed red clover by suppressing annual summer weed competition. Summer mowing thickened the “living mulch clover strips” and diminished weeds. While the living red clover mulch provides benefits similar to the imported rye straw there are many additional benefits. A fundamental benefit is no tillage following the removal of the tomato & pepper crops. Medium red clover continues to grow late into the fall as well as migrate where former warm season crops no longer occupy space. It’s dormant for the winter. It reawakens come spring and grows vigorously into the following summer months. As a legume, nitrogen is fixed throughout its growing cycle (~100-125 lbs of N/A). Medium red clover also produces significant biomass (2000-4000 lbs/A). Mowing controls annual summer weeds as they emerge above the clover canopy. Mowing stimulates clover root mass and development. One third of clover biomass is credited to its network of subterranean roots. By utilizing the living straw mulch technique over considerable acreage at Johnny’s this year, I was no longer pressed to make time in the fall to get my cover crops planted. In most fields cover crops had already been established months earlier. Bare soil cultivation between plastic mulch had been replaced with mowing of clover with the additional benefit of red clover fixing nitrogen to reduce soil amendment purchases for the upcoming spring.